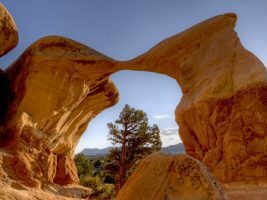 Environmentalists were outraged this past December when President Trump announced he was reducing the size of two national monuments in Utah: Bears Ears and Grand Staircase Escalante. These were big cuts: 85 percent for the former and 46 percent for the latter. To some observers this seemed illegal. Once established, parks were to be protected forever. Yet these were not national parks, established by their own individual laws passed by Congress, but national monuments, a different legal category. Their creation came from a presidential proclamation under provisions of the Antiquities Act of 1906. Congress had passed the law at the urging of President Theodore Roosevelt to prevent the looting of Indian artifacts in New Mexico and petrified trees in Arizona. Previously treasure hunters could go onto Federal land and scoop up items to sell as curios at shops back East. Almost immediately the law was used to protect large amounts of land rather than just curios, when President Roosevelt designated Devils Tower in Wyoming as a monument. Sometimes presidents have used designation as a prod to Congress to create a national park. TR designated Grand Canyon as a monument in 1908, ten years before it became a park. In 1978, Jimmy Carter grew frustrated at the slow progress by Congress to resolve land claims in Alaska, so he declared 56 million acres to be a monument, saying he would withdraw the designation when Congress acted. The result was the Alaska National Interest Lands Act of 1980. At first glance the 112-year history of Antiquities Act proclamations appears to show a one way path toward increased protection of the land without back sliding. It seems to be to be a ratchet: protection only moves forward, never backward. Yet this is not true. Nothing in the Act says monuments are inviolate. Presidents can remove areas from protection as Taft, Wilson, Truman and Eisenhower have done. For the Grand Staircase Escalante, the Trump Administration motivation appears to be to lease land for coal mining. Coal producers were ready to go in the 1990’s, which caused Bill Clinton to declare it a monument. Running for reelection in 1996, he made the political calculation that he could win more votes from environmentalists in California than he would lose from coal miners in Utah. This produced the famous photograph of him signing the proclamation at the Grand Canyon in Arizona, revealing he would not be welcome in the Bee Hive State. Trump’s motivation for cutting up Bears Ears is not apparent since the area lacks coal and oil reserves. President Obama’s justification was its religious importance for Native Americans. Trump’s motivation may simply be symbolic, to cater to Western public opinion that the Federal government should not be making the decisions about Federal lands. Local Republican politicians can rally support. Resource extraction is inherently suicidal. Jobs will be gone when the timber is harvested, and the mine is played out. Ranchers like cheap fees to run their cattle. The 2014 confrontation with Cliven Bundy in Nevada began when he refused to pay the already low grazing fee to the Bureau of Land Management. Bundy wanted something for nothing. The Antiquities Act has never attracted much attention from the courts, so no one can say for sure whether the Trump withdrawals are legal. The law says nothing about a presidential authority to remove land, but it seems logical that it is inherent. Author: Davis has held a political appointment in the Department of the Interior. Email him at [email protected].